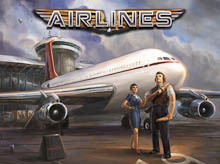 In Airlines players run an airline company and have to build up their airline fleet to carry passengers over the world. 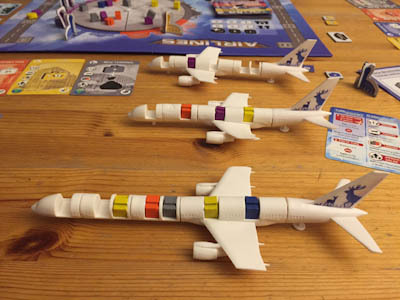 The game comes with a huge board and big airliner models that can be build up modular during the game. We all start with a single airliner with only a cockpit, wing and tail section. This airliner can hold up to 3 passengers, but can be expanded by any number of plane parts to transport more passengers. In the game you either can concentrate on expanding this airliner to transport more and more passengers or you you can build up to two more airliners to be more flexible. Next to the VP track and some smaller overviews, the board holds nothing but a rotatable globe that is divided into 5 sections. Next to each section we find a different coloured country where we can place our airports. Every player starts with only one terminal, but this also can change during the game. 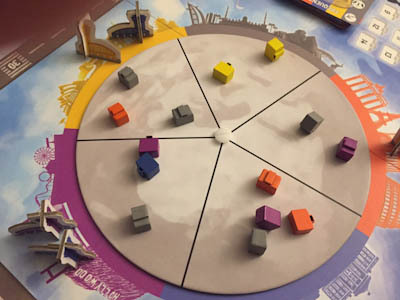 Passengers enter the game randomly at the beginning of the game and at the end of each player's turn. Finally all players get a hand of five cards. And for the set up, that is all you have to do. 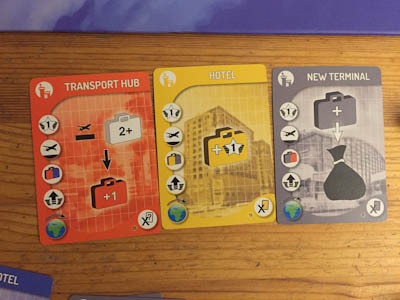 Surprisingly Airlines basically is a pure card management game. Each turn you play a card, use its effect and draw a new card. Cards are either building cards or special actions. With a building you can establish a new terminal (that let you land more passengers than usual)or a travel agency (that gives you additional VP when carrying a passenger) in the given country. Building actions must be paid by discarding other cards from your hand, too. Special actions on the other hand give you more variety, so for example with the construction site you would be able to construct a building without paying its costs. Or you could draw 2 more cards with an additional action still available. But next to these “airline actions” of the cards, each card can also be used for global actions. With these actions you can pick up new passengers from a section of the globe next to one of your terminals (again the colour of the card determines the colour of passengers you may take), landing your airline to drop-off the passengers for VP, a general income to gain more VP and – very important – an action to improve your airliners (either you expand an existing airliner, build a new one or you build a new airport in another country). With a single card you can use as many of these actions as the number of your airliners. With the huge, modular airlines the game really looks awesome. Especially children have have a lot of fun expanding their fleet and producing bigger and bigger airliners. Of course, in view of the fact that the game is more or less a hand card management game, it is nearly overproduced. But still the game feels to be right the way it is. There are some interesting choices to make and the idea of the rotating globe that brings the passengers to your airports is a clever idea. But there are also some weaker elements: First of all, the double function of the cards is hard to understand for a lot of people. The main reason for this are the inconvenient, partly distracting symbols on the cards that tell us how the card can be used. Especially the functions of the buildings are hard to deduce Another weaker point is the big dependence on luck. If you do not draw cards that fit to your strategy, it can be hard to find a turnaround. So some games end for the one or other player, before he really gets into the game, because he is not able to make use of his prior actions. 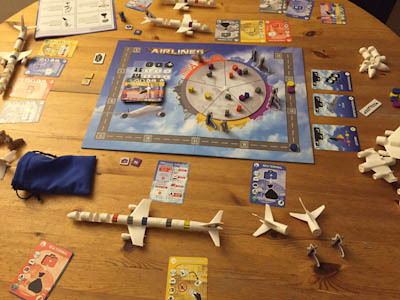 In the end Airlines is a solid, mid-weight hand management game with some smaller weaknesses. To my taste the duration (60-90 min) is too long for a card game, so some games tend to get lengthy. To get top marks from me the game is still to rough around the edges, although it definitely gets good marks for the awesome air-plane models.